The reason it took me awhile to start working on my beaded motorcycle project was because I had ordered custom parts for it, and I had to wait to get them! So, yesterday, I took a ride to Beaucoup Beads in Scituate Harbor to pick up some rims! 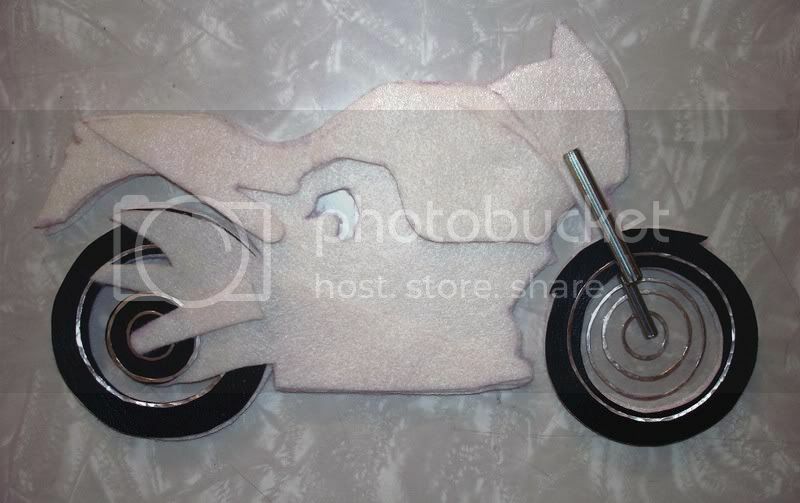 Felt foundation for a beaded motorcycle. 10″wide x 6″. >- ooo looking forward to see the finished work here.I love motorcycles!Do you ride? >You have excelled this time. This work is fantastic! >This one pleases the dickens out of me! The rings (rims) look great as does the cylinder gizzmo. Ha! I love it!Robin (biker babe) A. >Don’t you love working out stuff like the “how to’s?” That is my favorite part because it really stretches us. I know you can do it. >Your beadwork is really great. Love the dogs and cats and peacock. I am inspired to try some of the things I have been thinking about. Great website. >This is going to be so cute. >Wow, so intricate! Do you look at real motorcycles or photos as a reference, or do you ride one? >That is really cool – great work! >Looks like it will turn out great. Can’t wait to see it finished.